I have longed to make sourdough for many years and every attempt has failed. 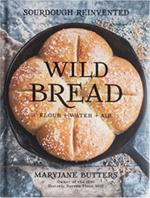 I bought MJ's wonderful Wild Bread book and was encouraged by her to use Kamut. I have my own grinder so that part was easy. But I just read in her Idea/Cook/Lifebook on page 149 that Kamut isn't very good for breads?! Tomorrow morning was our 7th day and pancake experiment and she says good for that but not bread? Anyone tried successfully to make bread with Kamut? Do I have to start a new mother culture so as to not mix the grains? Hi and welcome Donna from Paris in northeast Texas. I can't help you with your question since I only started my first ever Mother last Sat. Will be watching for MaryJane/Ashley's answer. Welcome Donna! That's the beauty of wild-yeast breads--using 100% whole wheat works much better (more loft--this one rose for less than two hours). I love the buttery color of Kamut for baking breads, but I used to blend it with some white flour to get the kind of loft we got in yesterday's wild-yeast 100% Kamut bread. As luck would have it, Ashley made a loaf just yesterday and for good reason, all that's left is a heel (just begging to be toasted with a layer of cream cheese smeared all over it) and one slice for maybe peanut butter and jam. Go for it! A Kamut mother is a great idea. 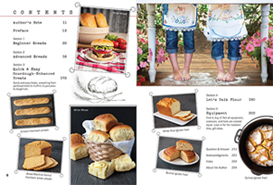 Enjoy your pancakes and soon enough you'll be making loaves of yummy bread. Check out all the photos of Kamut bread throughout Wild Bread (up next for you after pancakes would be Beginner Kamut p. 34) since my iPhone version isn't as mouth-watering. Hi Donna, and welcome to the chatroom! I love working with Kamut for making bread. You mentioned that you're milling your own. I�ve done the same it's a fabulous grain to mill. What I love most about it is the way the flour mixes in so readily and the way the dough handles. Here are a couple of images of a loaf of Kamut that I made this week. The first picture is of the dough right after I shaped it, and the second is after it proofed for just 1 hour and 25 minutes! The third was taken right after it came out of the oven, just before it was devoured. It appears that it is best to mix another flour with Kamut? Will spelt work or should I go to like a King Arthur milled flour? I really really want this to work. You guys would laugh if you knew how many 5# bags of flour I've wasted in my failed efforts. This book has been amazing though. Like a real mother teaching you side by side. No mixing with other flours necessary. As the book demonstrates/instructs (as well as the loaf we made this week that is 100% whole grain Kamut), you'll love the whole wheat Kamut. Stick with it. No other flour necessary. I thought I should show a photo before I ate them all. In this humid Texas climate I've always had to mix my floursto get the rise. The taste of these though, oh my. So I think I will start second culture of the spelt as I keep a lot more of that grain or does someone think it will work to mix grains? Book implies not to. And this has been a success and I don't want to tempt failure! Good morning Donna. Your Kamut creations are lookin' good. Sounds like they're tasting good also. What did you put on top of your flapjacks? I think you could add spelt flour to your creations during your final flour additions but I don't know the worth of creating a blended spelt/kamut mother just yet. We didn't test a spelt mother separately or blended but if you're wanting more loft, a duo spelt/kamut mother so soon might confuse things. I'm not sure what your goal is? Since you've started with Kamut, you should just stick with Kamut and continue with the Beginner instructions in Wild Bread. Ok. I was thinking I had to have a separate culture for each grain. Thank you for clarifying. You do need a separate mother for each type of flour if you're using it as your mother (starter) to give rise to bread. On the morning of Bake Day before you bake bread using your Kamut mother, you will need to add more plain flour, usually more Kamut. In your case, you might want to mix some spelt (non-motherized ... is that a word?) dry flour into the dough.